“The ear of the leader must ring with the voices of the people.” These words from Woodrow Wilson echo loudly across today’s Army. As the force faces potential peer adversaries, it searches for solutions to reduce traditionally long acquisition timelines and modernize its tactical network more rapidly. In support of this effort, program offices and cross-functional teams have embraced a Developmental Operations (DevOps) model, incorporating Soldier feedback from the early stages of the acquisition process and driving rapid improvements in critical mission command and tactical network systems. The Army’s Network Modernization strategy focuses on four modernization priorities known as lines of effort (LOEs): creating a unified network transport layer, building a common operating environment for mission command applications, improving Joint Force and coalition interoperability, and improving command posts’ mobility and survivability. Each of these LOEs utilizes DevOps to leverage experimentation, place capability in the hands of Soldiers early on in development, and inform design choices for the delivery of future warfighting systems. To meet the needs of improving command posts’ mobility and survivability, the U.S. Army Project Manager (PM) Mission Command, assigned to the Program Executive Office Command, Control, Communications-Tactical (PEO C3T), has employed the DevOps model throughout the development of the Army’s Command Post Computing Environment (CP CE). CP CE will consolidate current mission command systems and applications into a single user interface and allow commanders to see the same common operational picture. It also supports collaboration using a common picture with Joint and coalition mission partners and can leverage cloud and edge computing capability. By extending the framework of CP CE — being able to modify the system and write new capabilities on top of the existing one — PM Mission Command has been able to add features needed to carry out the mission and also ones suggested by Soldiers in the field. Variable Message Format was added to the software to serve as primary data exchange for messaging; three-dimensional maps and a DVR playback-like capability are currently undergoing lab testing at Aberdeen Proving Ground, Md., as a result of feedback from Soldier user juries. Considering the need for command post mobility and survivability, CP CE has incorporated significant size, weight and power reductions. The hardware-dense information systems that reside in current command posts rob units of mobility because of the labor-intensive processes to transport, set up, initialize, maintain, and dismantle. New Tactical Server Infrastructure version 2 (TSI v2) server stacks will provide increased capacity and capability with three versions — small, medium, and large — depending on the mission need. CP CE infrastructure software will be integrated and automated with the server hardware to eliminate the need for manually loading the software. Program Offices are using prototyping to help inform requirements through early Soldier involvement. Targeted R&D efforts with the Communications-Electronics Research, Development and Engineering Center (CERDEC) are focusing the lens on improving units’ expeditionary command post capabilities and provide more mobile, scalable, and survivable platforms. The Command Post Integrated Infrastructure (CPI2) effort ensures communications hardware and mission command application integration across platforms. The first part of the incremental approach, underway now, equips selected units with mobile platforms, secure wireless, and intelligent power solutions. Units then conduct their own integration of systems onto platforms in order to inform future command post designs. The second increment, beginning in fiscal year 2019, involves equipping five Brigade Combat Teams with mobile command post prototypes. “The outcome of this experimentation will inform both the CPI2 requirements and designs going forward. 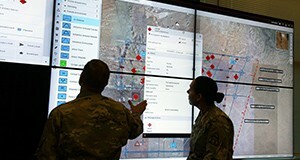 Together these phases will enable final command post solutions to be designed, integrated and provided to the Army through an established program of record,” said Veronica Ewing, Deputy Project Manager for Mission Command. With its role as the program’s central integrator, PM Mission Command is working to meet the necessary acquisition milestone to execute both the directed requirement and the formal CPI2 Program of Record at such time that the Army Requirements Oversight Council approves the CPI2 capability development document. A capability development document captures the information necessary to develop proposed programs, normally using an evolutionary acquisition strategy. CPI2’s strategy is to bring together existing programs through a system of systems approach to achieve the Army’s vision. To keep pace with the rapid pace of technology advancements, the program will also work closely with the Army’s organic research community. “We’ll be synchronizing with our S&T and PEO partners to determine when solutions reach a mature technology readiness level,” said LTC Antonio Sanchez, Product Director for Strategic Mission Command. PM Mission Command is also using DevOps to explore potential improvements to the Army’s critical friendly force tracking system Joint Battle Command-Platform (JBC-P). Responding to units’ requests to take JBC-P features outside their mounted platforms, Army researchers are prototyping options for experimentation. The project, known as Expeditionary JBC-P (X JBC-P), aims to inform future decisions to deliver the vehicle-based Blue Force Tracking system’s capabilities to dismounted Soldiers. The goal is to develop a kit that is lighter and smaller, has a longer battery life, and is safe for Soldiers to use while dismounted. The components taken from the currently fielded mounted JBC-P system are too cumbersome and heavy for a Soldier to carry for long distances in a rucksack. The partnership between CERDEC and the Program Office is yielding significant results for DevOps assessments, said J. Tyler Barton, science and technology demonstration-objective manager for expeditionary mission command with CERDEC’s Command, Power and Integration Directorate. In June, Soldiers in the 67th Expeditionary Signal Battalion (ESB), 35th Theater Tactical Signal Brigade (TTSB) at Fort Gordon, Georgia, became the first unit equipped with the expeditionary Terrestrial Transmission Line-of-Sight (TRILOS) radio after new equipment training and fielding from Project Manager Tactical Network and the Communications-Electronics Command (CECOM). To speed development, the PM relied heavily on Soldier feedback from pilot units, enabling the PM to continually improve the new systems prior to formal fielding. The TRILOS radio sets up rapidly for robust expeditionary tactical network communications in a small form factor system that provides significant size, weight and power reduction compared with the legacy at-the-halt High Capacity Line of Sight (HCLOS) radio. Following the DevOps process, the PM took Soldier feedback from the operational test last July directly to its industry partners. Together they integrated 12 refinements to the TRILOS radio within 45 days of the conclusion of a Network Integration Evaluation (NIE). The PM then demonstrated these enhancements during a full follow-on capability demonstration last September at Fort Hood, Texas, which enabled the 57th Expeditionary Signal Battalion and the 11th TTSB to see firsthand that its feedback had been heard and implemented and to ensure that the capability was ready to be fielded. “What I thought was most impressive was the follow-up and then the response time in terms of speed to action,” said LTC Patrick Lane, Commander of the 57th ESB. The Army Network Cross-Functional Team (CFT) is conducting experimentation to provide a portable, medium-to-high bandwidth beyond-line-of-sight communications and networking capability to allow Brigade and below formations to network locally and access mission command voice and data. Known as the Integrated Tactical Network, or ITN, the effort will enable commanders to lead and fight their formations from anywhere they choose. The ITN began as a company-level DevOps experiment using a secure but unclassified network capability focused on the tactical edge by the 1st Battalion, 508th Parachute Infantry Regiment (1-508 PIR) of the 82nd Airborne Division. Success of the company event led to the equipping of the battalion for a Joint Readiness Training Center rotation last November, followed by platoon-level training exercises at Fort A.P. Hill—held this March—that expanded to include mission command capabilities. Program Offices are working closely with the Network CFT on the experimentation and proof-of-concept efforts underway with U.S. Army Forces Command units, including the 1-508 PIR and 1st and 2nd Security Force Assistance Brigades. The outcomes of this process will inform technology selection and product development for future tactical radios products. Reaching out to industry partners and leveraging Soldier feedback from in theater, NIEs, and Soldier user juries and pilots will help the Army get needed capability into the hands of Soldiers at an accelerated pace, keeping them one step ahead as technology continues to evolve.